kitchen smelling like an abandoned dairy. I usually lose that one. frying pan in the sink) that proves I cooked dinner and am therefore exempt under the ‘‘whoever cooks doesn’t have to clean’’ rule. 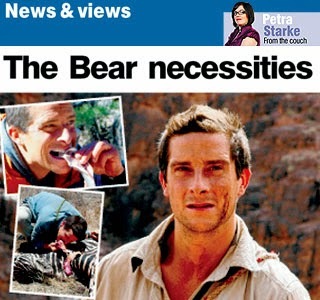 For the three people who watch Stargate Atlantis or The Mentalist on Monday nights instead of SBS, allow me to explain: Man Vs Wild is a weekly nature show starring Bear Grylls, a handsome and overly earnest English survivalist who likes to put himself in dangerous situations just to show you how to get out of them. But ever since Man Vs Wild began airing in 2006, debate has been raging about the show’s credibility – or more accurately, that of its host. Put simply – fans are divided over whether Bear really does s*** in the woods. from a busy highway. There’s another that shows ‘‘wild’’ horses he tamed and rode in the Sierra Nevada are wearing horseshoes. And then there’s the most damning of all – a crew member dressed in a grizzly bear suit. Seems Grylls isn’t the only fake bear on Man Vs Wild. Nevertheless – I find Bear’s antics fairly impressive, given my usual approach to surviving in foreign locations involves finding the nearest pub and waiting until help arrives. He might be lying about the volcanoes and horses and grizzlies – but you can’t fake that bod. First published in the Sunday Mail, January 10, 2010.